Closed, meaning that it is no longer active. If a connection is Open, then we can also send messages to the other end of the connection, and recv messages from it. These functions cover the state transitions in the diagram above, but none of them explain how the operations affect the state! It’s perfectly possible, for example, to try to send a message on a socket which is not yet ready, or to try to receive a message after the socket is closed. Using ST, we can provide a better API which explains exactly how each operation affects the state of a connection. In this section, we’ll define a sockets API, then use it to implement an “echo” server which responds to requests from a client by echoing back a single message sent by the client. We create sockets using the socket method. The SocketType is defined by the sockets library, and describes whether the socket is TCP, UDP, or some other form. We’ll use Stream for this throughout, which indicates a TCP socket. Remember that addIfRight adds a resource if the result of the operation is of the form Right val. By convention in this interface, we’ll use Either for operations which might fail, whether or not they might carry any additional information about the error, so that we can consistently use addIfRight and some other type level functions. However, using or is much more concise than this, and attempts to reflect the state transition diagram as directly as possible while still capturing the possibility of failure. If there is an incoming connection from a client, accept adds a new resource to the end of the resource list (by convention, it’s a good idea to add resources to the end of the list, because this works more tidily with updateWith, as discussed in the previous section). So, we now have two sockets: one continuing to listen for incoming connections, and one ready for communication with the client. That is, we can close a socket which is Open, talking to another machine, which causes the communication to terminate. We can also close a socket which is Listening for incoming connections, which causes the server to stop accepting requests. We’ll see how to implement this shortly; mostly, the methods can be implemented in IO by using the raw sockets API directly. First, though, we’ll see how to use the API to implement an “echo” server. If accept fails, we need to close the Listening socket and remove it before returning, because the type of echoServer requires this. It’s convenient for new to add the resource to the beginning of the list because, in general, this makes automatic proof construction with an auto-implicit easier for Idris. On the other hand, when we use call to make a smaller set of resources, updateWith puts newly created resources at the end of the list, because in general that reduces the amount of re-ordering of resources. For the complete implementation of Sockets, take a look at samples/ST/Net/Network.idr in the Idris distribution. You can also find the complete echo server there, EchoServer.idr. There is also a higher level network protocol, RandServer.idr, using a hierarchy of state machines to implement a high level network communication protocol in terms of the lower level sockets API. 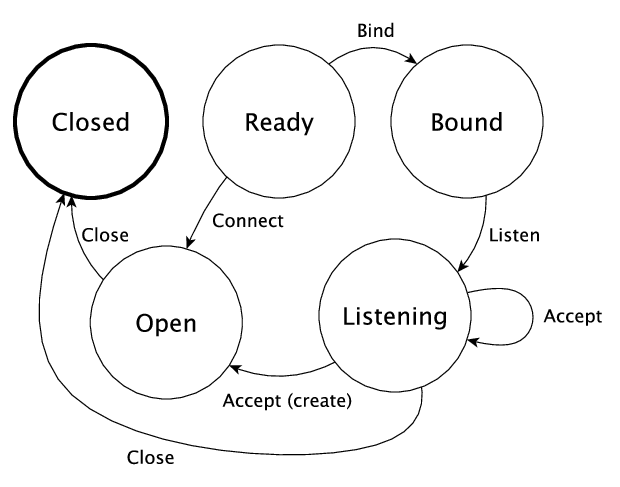 This also uses threading, to handle incoming requests asynchronously. You can find some more detail on threading and the random number server in the draft paper State Machines All The Way Down by Edwin Brady.